Piotr Domek’s life changes suddenly when his father Pawel, a security guard at a local theatre, is suspected of the high profile theft of a diamond necklace belonging to Betty Massino, a Hollywood star appearing at the theatre. Piotr’s father is a proud man and plans to move the family back to Poland, his homeland, to avoid the shame of this wrongful accusation. The theme of identity is explored when we hear the extent to which Piotr values his dual heritage and doesn’t want his ‘world to shrink to just one word for potato or sister or tree’. Can Piotr prove his father’s innocence and avoid leaving the UK for Poland? Luckily Minnie and Andrew, Piotr’s friends, come to his aid. With their help, and the assistance of twins Flora and Sylvie, all the possible suspects are gradually eliminated until the real thief is unmasked and Piotr’s father exonerated. The five friends, the Marsh Road investigators, each bring different skills making them a great team. The ‘character stats’ at the back of the book provide a summary of their various characteristics and strengths. Surprisingly, it is star struck Andrew whose eye for detail eventually helps the team solve the crime. This is a page-turning mystery with a satisfying ending. The Marsh Road investigators form a contemporary Famous Five equipped with camera phones, tackling crime in an urban setting. 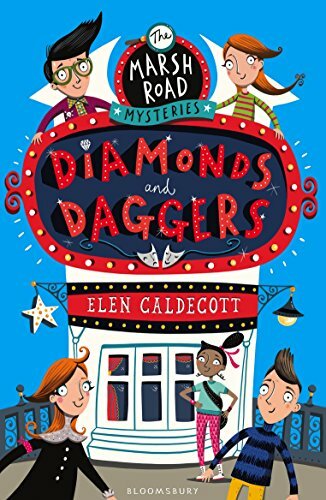 Diamonds and Daggers is the first of a new series of mystery adventures featuring the Marsh Road investigators.